What Could Cause a Kitten to Lose His Equilibrium? Pay attention to your kitty's equilibrium problems. If you notice that something just seems to be "off" with your wee kitten's equilibrium, don't dismiss it as being nothing. Balance problems in cats can often be indicative of various medical disorders, from ataxia to deafness. For your precious kitty's sake and well-being, pay attention and take action immediately. The vestibular disease "ataxia" may be the culprit behind your kitten's balance loss. If something is wrong with your pet's gait, it could be due to limb coordination problems. Pay attention to telltale symptoms of the condition, including nausea-induced disinterest in food, temperament changes, abnormal sleepiness, head tilting, hind leg weakness, stumbling, unusual eye motions and hearing difficulties. If you suspect that your kitten has ataxia, seek veterinary attention as soon as possible. Another possible cause for a wee kitten's equilibrium loss is deafness. Aging is not the sole cause for hearing loss in felines. Kittens can experience deafness due to a lot of different reasons, including injury, infection and even ear mites. If you notice that something just isn't right with your kitty's gait, don't rule deafness out and investigate the little one's ear situation. 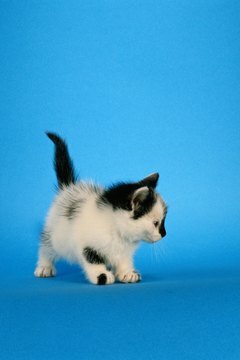 Cerebellar hypoplasia is another possible reason for a kitten's unbalanced walk. The developmental neurological disorder begins at birth in cats. When a kitten's cerebellum isn't fully formed upon exiting the womb, it often leads to this condition. The cerebellum is responsible for the body's coordination, hence, loss of balance. In some cases, nutritional problems can bring upon balance issues in young cats. If a kitten doesn't get enough of the B vitamin thiamine in her diet, it could cause weakness and ultimate balance issues with walking. No matter what, it is important to seek veterinary attention when you notice that your precious kitty's balance just doesn't seem quite right. If your sweet kitten was just recently spayed or neutered, an unsteady walk could also indicate an unusual reaction either to surgery or anesthesia. Get emergency medical attention for your kitty if she experiences balance issues during spaying or neutering recovery time. Other warning signs to look out for post-surgery are gum paleness, bleeding, depression, shivering, appetite loss, diarrhea and throwing up. What Are Cats Trying to Tell Us When They Meow? What Is Middle-Aged for a Cat? What Does It Mean When a Dog Spins in Circles? Are Lhasa Apsos Easy to Train?